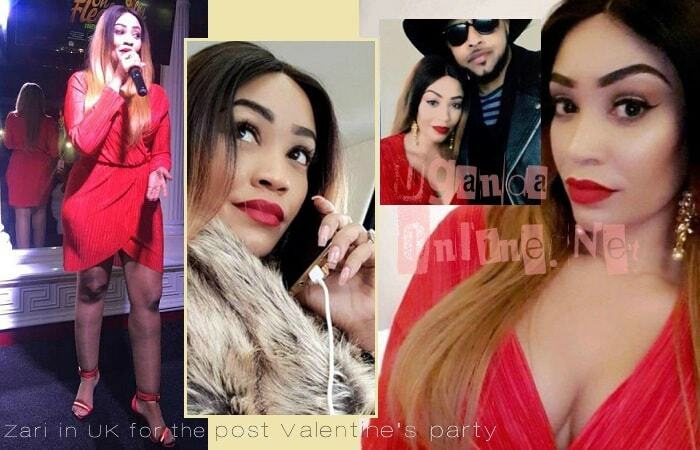 Zari was in the UK for a post Valentine's party that was held in North London on Feb 23, 2018 in Woodgreen, Wasafi Records signed artist, Ray Vanny was the lead performer doing some of his hit songs that include 'Siri' among others. Zari was in the company of some yet to be identified dude and on the sidelines of her visit, she visited BBC for an interview in which she revealed what exactly happened to her relationship with Tanzanian singer, Diamond Platnumz and the way forward. In the interview, the mom of five said that his now ex-lover, Diamond Platnumz, did not see this coming. "It's five weeks now we are not in touch, the trust is broken, we are done." "The thing is, we were trying to move on from the Hamisa Mobetto child scandal, but you always hear this about him, see him with his ex, Wema Sepetu, and so many other things that are disrespectful to even our children, that is not right." "Right now that trust is broken and we are done and I don't know what's up with him"
Zari was asked if anyone at all was sent to South Africa to try and talk over this, 'No Comment' was her response. How about your mother in law? "I would rather keep her out of this, I respect her as my mother-in-law and granny to my children." Going forward, I do a lot of things because even before Diamond Platnumz, I was Zari the Boss Lady, so will continue with my reality show that I did while still with Ivan (RIP), show appearances, host events, adverts and so many other things. What about your music career? I'm not going back to singing, but will concentrate mostly on season 2 of my reality show dubbed Life of Zari the Boss Lady that will be streaming live on my social networks. Trust Spice Diana, two weeks after her 32-point-drama, she has released a song about it, sge features Weasel. Fans are now wondering if she will also hit studio to do a song about her weave that fell off her head while appearing on TV. This is exactly how she does her thing not forgetting the Anti Kale song..